Viviscal Concealer promises a quick, simple and effective approach for covering up your thinning hair. The concealer is made from fibers that immediately attach to any thinning hair using an electrostatic charge, so the hair appears thicker – eliminating the bald areas. Viviscal Concealer Fibres are easy to apply and look really natural and undetectable. You can use as much or as little as you like to make a subtle or dramatic difference to your appearance. The results need to be seen to be believed but no-one needs ever know your secret. Simply tap the fibres liberally onto your dry hair until your scalp is no longer visible and your hair looks thicker. Gently stroke the area to scatter the fibres evenly and wash your hands after. 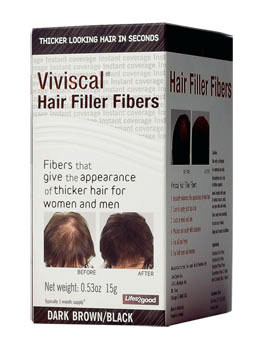 Viviscal Concealer Fibres are the latest product from Viviscal designed to provide a cosmetic/cover-up interim solution to disguise the problem of thinning hair. As each fiber has an electrostatic coating, they instantly bind to the hair shaft building hair density, providing greater coverage and a thicker, fuller-looking head of hair in just 30 seconds. For longer lasting results, lightly spray with hairspray. Viviscal Concealer Fibres are made with keratin has a patent-pending electrostatic coating which binds to your existing hair to add volume, create the appearance of thicker fuller-looking hair and to make the scalp less visible. Viviscal Concealer Fibres are available in six natural looking colours – black, dark brown, light brown, blonde, grey, auburn – to blend naturally with all hair shades.